Hiroshi Abe (阿部 寛, Abe Hiroshi, born 22 June 1964) is a Japanese model and actor. 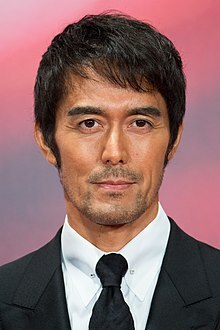 He is known for his roles in Still Walking, Chocolate and Godzilla 2000: Millennium. In 2009, Abe won the Best Actor award in the 63rd Mainichi Film Award for his performances in Still Walking and Aoi Tori. Abe also starred in Hideki Takeuchi's Thermæ Romæ. He then played a supporting role in Hirokazu Koreeda's I Wish. ^ a b "Ponyo, Sky Crawlers Win at 63rd Mainichi Film Awards". Anime News Network. 21 January 2009. ^ Adams, Mark (7 September 2012). "Thermae Romae". Screen International. ^ Chang, Dustin (10 May 2012). "I WISH Review". Twitch Film. ^ "Thermae Romae Manga Gets Live-Action Film Sequel (updated)". Anime News Network. 29 January 2013. Retrieved 24 September 2013. This page was last edited on 13 April 2019, at 00:11 (UTC).